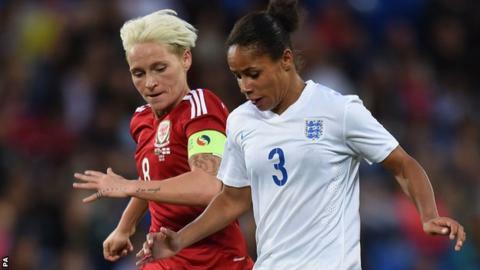 In her latest column for BBC Wales Sport, Wales Women's captain Jess Fishlock looks ahead to Wales' crucial World Cup qualifier in Ukraine on Wednesday, where a victory and favourable results in the other groups could see them secure a play-off place. This game on Wednesday is by far the biggest that Wales as a women's national side have ever faced. Ukraine's 8-0 win over Turkey on Saturday doesn't really change anything for us in the group. It doesn't matter if they'd have won 1-0 or 100-0. None of us followed the game and we only found out the result in a team meeting on Saturday evening. We didn't follow it hoping Turkey were going to win because it really didn't matter for us. We're just focused on us. The best thing we can do is go over to Ukraine, get three points and see where that leaves us with regard our play-off chances. We're going over there knowing that we were always going to have to win this game if we want to achieve what we want to achieve. A draw is no good if either of us want to go through to the play-offs. We simply have to win. The 4-0 home defeat to England hasn't hindered our campaign because we weren't expected to win or get any points. The big game was always Ukraine. Ukraine are a good side, very experienced and playing well right now. It's going to be a very difficult game and we've got to remember we drew 1-1 against them at home in April in a game we arguably should have won. The pre-match selfie is something that makes us a little more relaxed and gets us together before we play the games. It started as a little joke on my part but it seems to be quite popular so we just continued it and it seems to be a little good luck thing. We're not going to change that. It's been part of the whole campaign and hopefully we can have some nice weather on Wednesday to take what will hopefully not be the last pre-match selfie of this campaign. We're a close-knit squad and we've had to be with injuries and other things affecting us during this campaign. We've lost three players - Helen Ward, Gwennan Harries and Hayley Ladd - who you would say would be part of our starting XI and we've had to build around that and keep everyone close. That's why I have a lot of respect for these girls and for what they do because losing three first-team players would hit any team and we've still managed not to drop points against the teams we could have dropped points to. Seven group winners advance directly to the finals with six teams, including England, already guaranteed their place in Canada next summer. Four runners-ups with the best record against the sides first, third, fourth and fifth in their groups will advance to the play-offs. Scotland have already secured a play-off spot but will qualify automatically if they better the 3-1 result current Group Four leaders Sweden recorded against them in June. Italy are also through to the play-offs leaving seven teams in five groups, including Wales, chasing the final spot. That's a huge positive and shows how together we are. On a personal note, it was nice to be included in the National Women's Soccer League's best XI but disappointed Seattle Reign finished the season losing to Kansas City in the play-off final. We played well but it was one of those days with the luck not going our way and Kansas defended really well and scored two great goals. We didn't want it to end that way and it was hard to take, but Kansas are a very good side. After completing my second season with Seattle in the NWSL, I have joined German side Frankfurt on loan. Frankfurt are a huge side in Europe and making huge strides to win the Bundesliga and the Champions League and that's something I wanted to be a part of. I can't wait for the Champions League campaign and am so excited because Frankfurt have what it takes to go all the way. On a personal level I wanted to be closer to my family and be home for Christmas and not travel so much during my off-season.